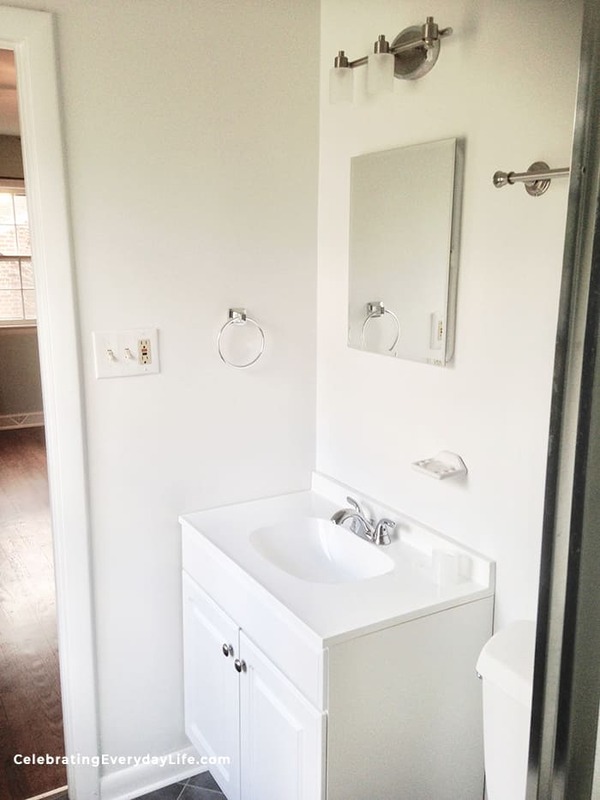 Need help with How to Stage a Bathroom? You're in the right spot! 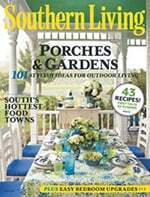 Home staging is proven to have a tremendous impact on how fast your house sells and for how much. No joke! There's a lot potentially riding on how your house is presented and I want to help you make it stand out in the market. 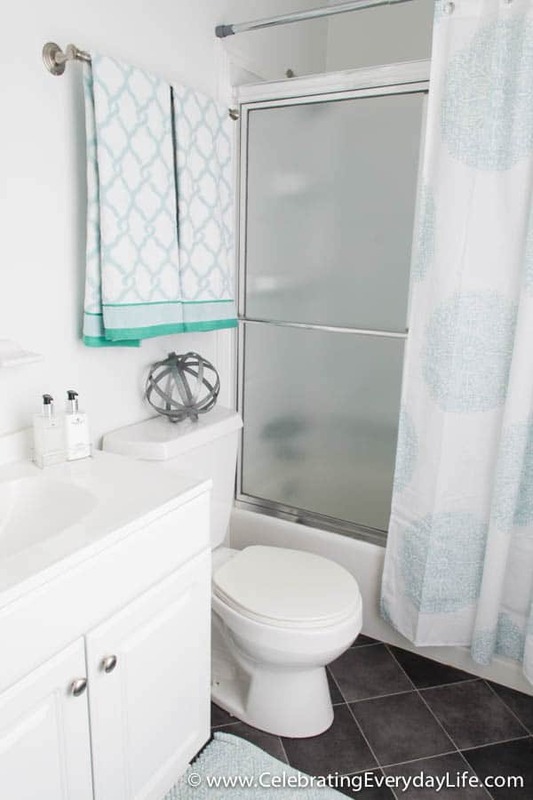 Bathrooms are very important spaces to consider when staging. Like the bedroom, less is definitely MORE in here. 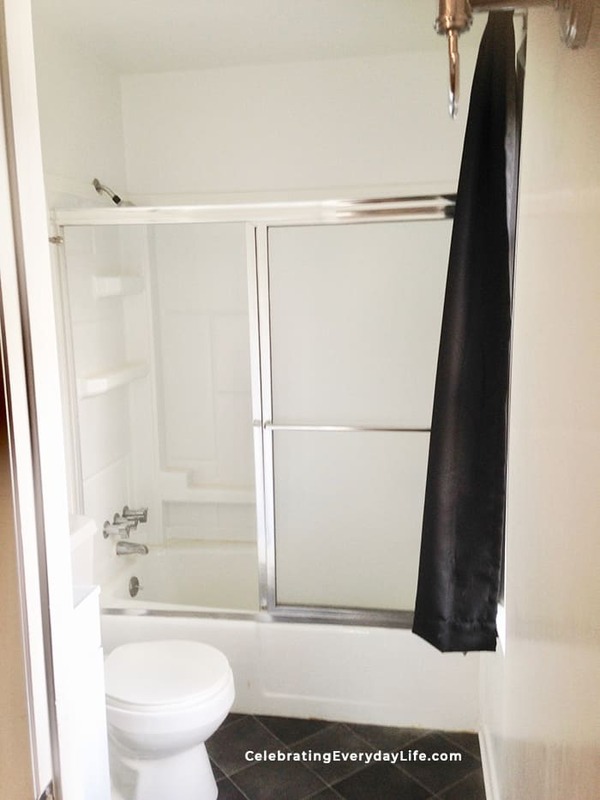 Today we are going to look at two bathrooms. Both are in a home that I staged that sold in 24 hours and over asking price. These bathrooms prove that even the smallest, most modest bathrooms can make a great impression on buyers. A plain all-white room, except for the dark gray floor. I loved the window in there because it brought great light into the room. The good thing about a plain white room is that it gives you a blank slate to create from. 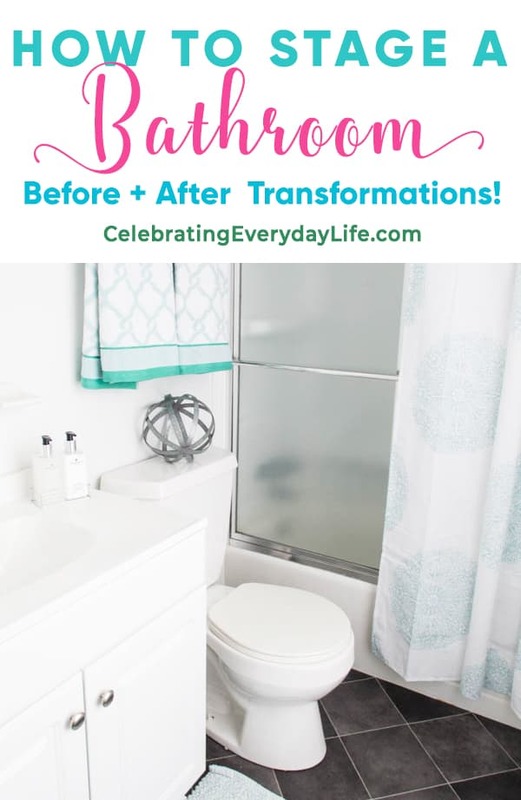 Small changes can add up to a BIG impact, especially in a small bathroom! In this first bathroom, I decided to use white damask towels. As a professional home stager, I like to have classic neutral items like these which I can use again and again with a variety of color palettes. 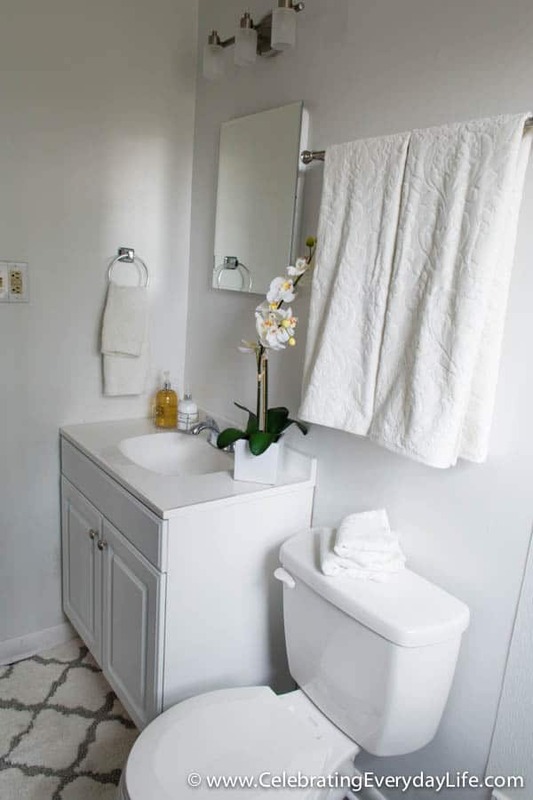 Even though this bathroom already had a lot of white in it, and it could be easy to make it boring, by using luxe items like the white damask towels they added texture and kept the small space feeling open, light, and airy. Critical elements that buyers react to in a positive way. We all want more space! Now, even though I chose to use mostly white accents, I still did want to add a bit of drama. The bathroom floor is a dark gray slate tile and I decided to add a gray shower curtain as an anchor in here. This dark grey curtain hits just the right note – especially since this shower/tub combo has that bright window in it. If there was no window, I would have probably gone with a lighter toned curtain. Consider the amount of light when making decisions like these to avoid accidentally overwhelming petite spaces like these. On the vanity, an orchid in a sleek modern container lends a bit of “life” in here (even though it's faux!) and a hand soap and lotion duo tucked in a chrome carrier add a bit of hotel posh to the vanity. A cushy mat underfoot in a coordinating (but not too matchy) Moroccan pattern completes the space. And in my opinion, that's all you need to make a bathroom really shine. 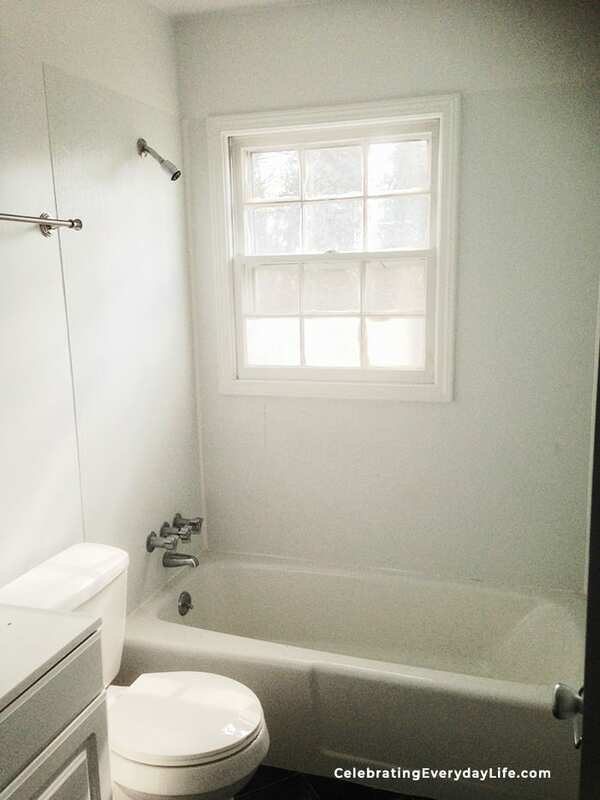 The second bathroom that we'll review today is a small master bathroom that had a common feature that many homes battle – a sliding door for the tub/shower. One of my pet peeves is short drapes like the ones that you see here. They were hung by the home seller and as you may imagine, were the first things I took down in this bathroom. Next, I knew we had to tackle the sliding bathtub door. While this is a very practical feature, it, unfortunately, does not have much of a luxury factor. And since this is the master bathroom in this house I knew we couldn't just leave it. To soften the harsh, cold lines I opted to add a shower curtain over the doors. Is it redundant? Yes. Does it make it all appear softer and more welcoming? Absolutely! So it was worth it! As I mentioned, this is the en-suite bathroom for the bedroom featured in this how to stage a bedroom post. I wanted the aqua and white from the bedroom to flow into here so that it really felt like an extension of the room. 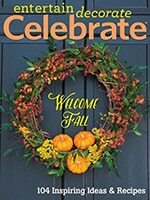 To help everything not feel too matchy-matchy – which can cause a home to feel dated – something you need to be even more careful about in an older home like this one – I used items in the same color tones but different patterns. This is a terrific “trick” you can use to add consistency and still maintain a fresh, on-trend style. An architectural garden sphere placed on the toilet tank looks almost like modern art and adds interest and texture while also tying in nicely with the floor color and drawing a bit of it up. Simplicity is again the key to the vanity here. Prospective buyers don't need to see an icky old bar soap, toothbrushes, etc… If you are living in a home while it is on the market, I suggest tucking those away in the cabinet so that a fresh clean slate is all the potential buyers see. Remember they are likely to look in that cabinet though, so make sure it's tidy! 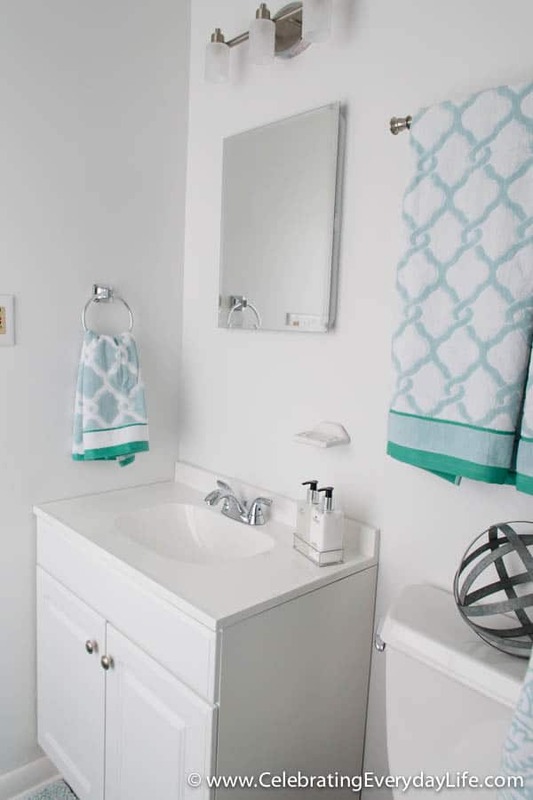 Because this is also a bright white bathroom, I selected towels that have a subtle punch of color – to make the space feel sophisticated and not boring. 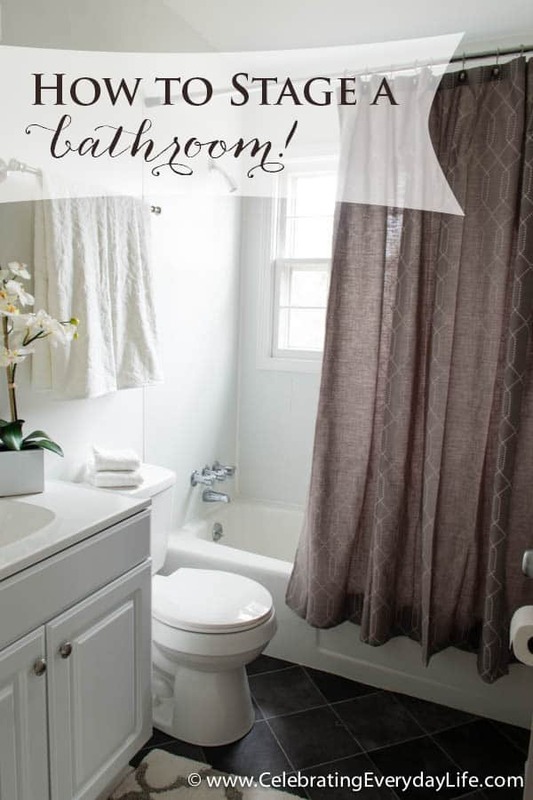 And there you have two stylish bathrooms sure to inspire potential buyers! Hi Marisa…..just a thought about the electric toothbrush. You could take a large box of tissue and open one end and take all the tissues our (rather than push out the perforated opening.) Then cut the flaps from that end only. Cover the rest of the box in a pretty fabric or shelf paper and pop it over your toothbrush. You could even cut a little notch in the back that fits nicely over the cord just to snug it down a bit. I haven’t tried this but curious if it could work? Our girls have a mounted medicine cabinet over their outlet. We drilled a hole in the bottom of the cabinet so the toothbrushes and bases can hide inside while the cords fish through the hole and to the outlet. My husband and I have our brushes on the counter and use small, pretty cups to rinse after brushing, and then just put them upside down over the tooth brush head. It looks nice and tidy and keeps the heads more sanitary as well. Hi Jennifer. Yes! 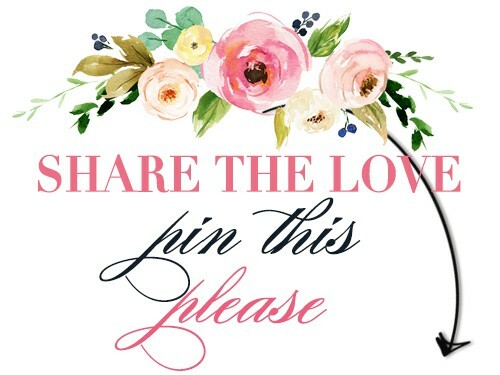 That is the beauty of a blog and I love yours! You have a blessed day too! My master bathroom and second bathroom are long. There’s only a single vanity in both. 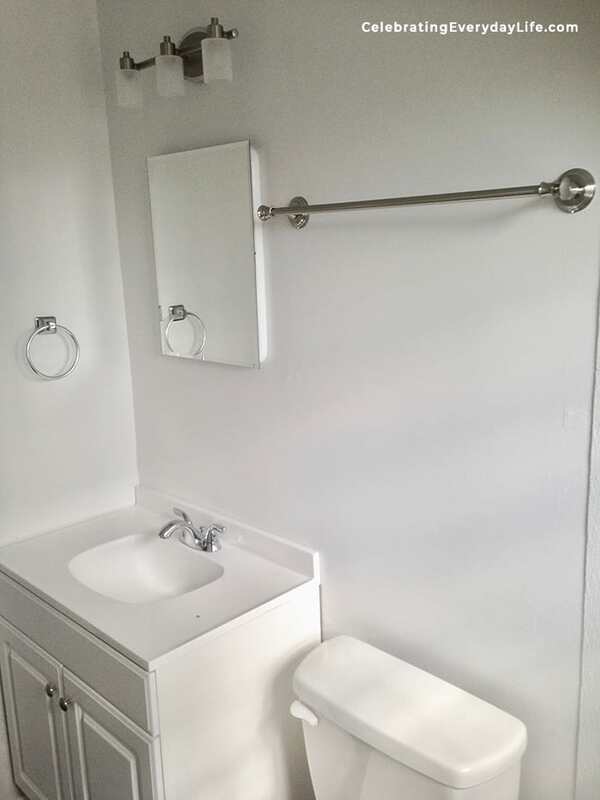 What could I put in the space between the vanity and the toilet? Towel hooks, small cube shelf, ladder shelf? We’re getting ready to sell and I’m concerned the single sinks will be turn off. And don’t forget to put the lid of the toilet seat down…. You didn’t mention it but i was glad to see you did it. I may be the only one, but I think the seat should always be down. Staging is so important especially when you are looking to sell your home. I love your minimalist style. A good rule of thumb is to remove about half the stuff you have in any room. Let buyers see that sleek bathroom that shows off how much space is really there, even if it is on the small side!